How To Backpack Sydney Like A Pro - Cheaper, Easier & More Fun!!! Have you been dreaming of travelling to Australia for a long time? For travellers from Europe and North America, taking the plunge and coming “down under” is on many a wish list. Whether you yearn to go snorkelling in the Great Barrier Reef, go surfing with the dolphins (and Chris Hemsworth) at Byron Bay, explore the laneways and culture of Melbourne or visit the world-famous sights and sounds of Sydney, Australia has something for everyone. But because Australia is so far away, here is a guide to backpacking Sydney like a pro to make sure that you get the most out of your dream trip. Strap yourself in and get ready for an awesome trip “down under”. Sydney is expensive. In fact, The Guardian recently highlighted that Sydney is the 10th most expensive city in the world, ranking higher than New York and London. So if you always dreamed of coming to Sydney and eating at the most distinguished restaurants and staying at boutique accommodation, you had better have some serious cash saved up. So to help you get the most bang for your buck, here are some tips to help you live a champagne lifestyle on a beer budget. One of the big challenges of a Sydney holiday is finding great value accommodation in the centre of the city. To maximise your time while staying in the world’s most beautiful harbour city, you should stay as close to the city as possible. Traffic can get hectic coming from the outer suburbs into the city. Waiting for hours on the M5 or getting sandwiched onto a train are stressful Sydney experiences that are best avoided. If you stay in the city, you will have more time to explore the wonders of the city and less time travelling from your accommodation in the outer suburbs to the CBD. Jolly Swagman Backpackers Sydney offers amazingly affordable hostel accommodation right in the heart of Kings Cross. For over 20 years, the team at Jolly Swagman Backpackers Sydney have been providing great value for money accommodation in an awesome location. As your accommodation is one of the biggest expenses of your trip, if you can find budget accommodation that is comfortable, you can really stretch out your holiday money. 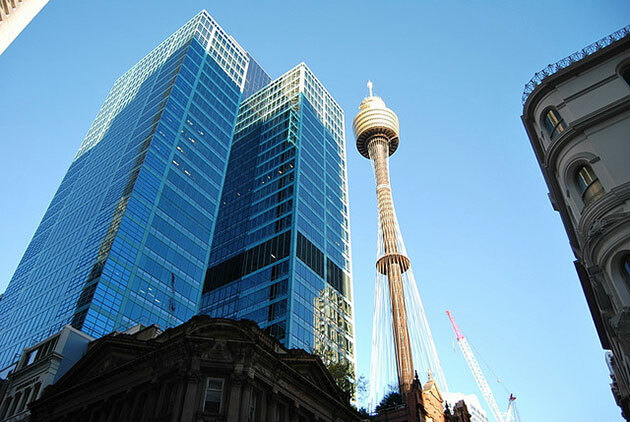 Visit the Jolly Swagman Backpackers Sydney website for the best rates and to find the 20 best things to do in Sydney. If you are coming to Australia for less than three months you can apply for a 90-day tourist visa. Working holiday visas are available as well if you have the circumstances. A lot of travellers enjoy the convenience of the Working Holiday Visa as this allows them to recharge their funds by working in the fruit picking industry in a rural region during their stay. Not only can you lengthen your stay by working for casual stints in Australia, but you also get to experience staying and working in rural Australia. When Is The Best Time Of Year To Visit Sydney? Summer – For the best beach weather, awesome festivals and a chance to go to the cricket at the SCG, Summer is the perfect season. If you visit Sydney in the summer, don’t forget to bring your sunscreen, a good hat and some thongs. Before you get too excited, thongs in Australia means flip-flops or sandals. Autumn – With fewer tourists than in Summer, Autumn still affords you the opportunity to experience some really warm days and the water at the beach is actually at its warmest in March and April. Great time of year for hiking and other physical activities. Winter – The cheapest time of year to visit Sydney. Winters in Sydney are very mild, so you can still explore the great outdoors and enjoy the crispness of the air. It’s the perfect time of year to enjoy the trendy bars and cafes. 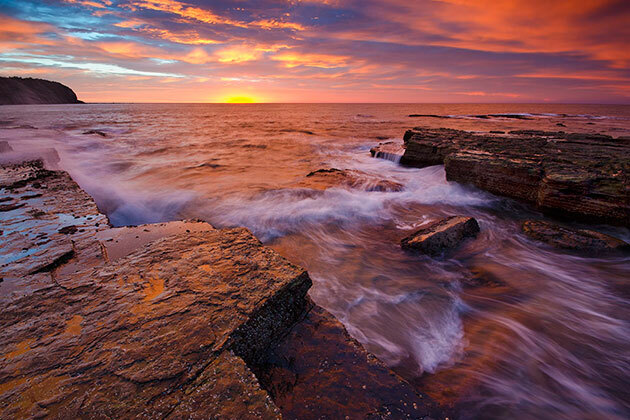 Spring – The driest season in Sydney so is the perfect time for long walks on the beach and epic sunrise photography. The whales are in full view off the coast from May to November, so this is the most pleasant season for whale watching off the coast. Don’t waste your money on a harbour cruise. You can get the same breathtaking scenery by taking the ferry from Circular Quay to Manly for a fraction of the price. For only $7.35 you will experience one of the most picturesque public transport trips in the whole world. There is something quintessentially joyful about surfing at Bondi. It is not the best surfing beach. It is not the easiest beach to access. Everything is overpriced and can be a little bit soulless. But it is still magnificent with crystal clear turquoise water that laps onto an expansive soft sand beach. If you would like to try surfing, Bondi surf schools offer a fun and affordable option. Unless you have surfed before or you are going with some friends who know what they are doing, don’t hire a board. There can be strong rips at Bondi and the Surf Lifesavers have enough on their plate without trying to rescue you as well. Book in for a surf school and they will ensure you get to learn to surf in a safe environment. 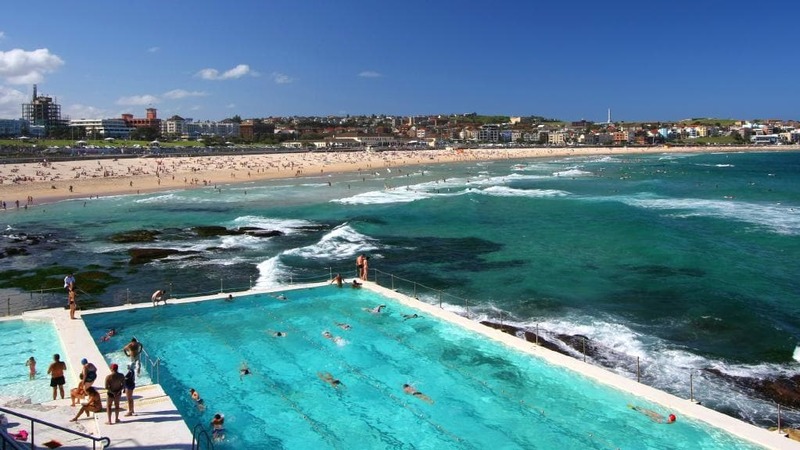 Sydney Water Temperature – The best months to learn to surf in Sydney are from January to May when the swell is gentler and the water is warmer. Swellnet – If you can, choose a day when the swell is 0.5 to 1 meter. The Bondi to Coogee walk is the best free attraction in Sydney. Make sure that your camera and phone are fully charged before you undertake this walk. The scenery is mind-blowing and you are going to want to splash it all over your Instagram feed. There is no doubt that the best view of Sydney is from the top of the Sydney Harbour Bridge. At the peak of the bridge, the view is amazing and includes the Sydney Harbour, CBD and the Sydney Opera House. But it does cost up to $393 to get access and you cannot take photos from up there! Thankfully, there is a cheaper option. The nearby Pylon Lookout offers a similarly Instaworthy view for a meagre $15 and you can snap as many photos as you want! You do have to climb 200 stairs to get to the top, but the view is absolutely worth it. If you have been planning a trip to Sydney, stop planning and get over here! 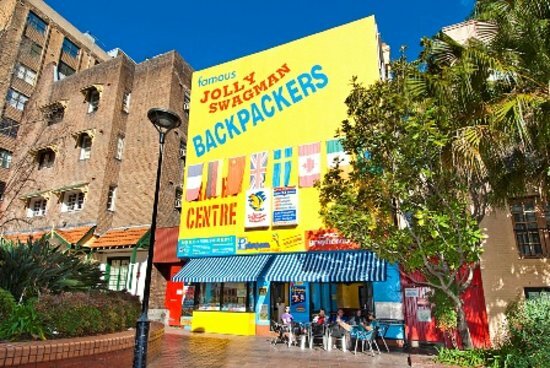 Book a room at Jolly Swagman Backpackers Sydney and start exploring the world’s most beautiful harbour city. Order a latte and smashed avo and finish off with a pot of Tooheys New. Come and find out the reason why the Swagman was so Jolly.